This quite possibly has to be the sweetest gift ever! I was born in 1989. This means I was a typical 90s kid in essence. Adidas tracksuits, The Spice Girls and all round bad fashion, oh yes I lived it. But if there is one thing that remains a fond and joyous memory it has to be that of the Cadbury chocolate money box machines. My Mum would bring them out every year and they always were a sure sign it was Christmas time. I loved the fact that they were much more complex than say a selection box, the thrill of inserting a coin and in return receiving a single miniature piece of chocolate sure was a necessity. And then when Christmas was over, it was all the more fun opening the back up and counting up the pennies saved. When we opened this gift yesterday morning, both mine and the Mr’s heart skipped a beat; for he too has his own childhood memories of these. I’m not quite sure about the price increase per chocolate, but hey it’s little surprise with the economy the way it is, we are now paying 10p per chocolate instead of 2p. For the pure nostalgic thrill this is simply genius. Come on, hands up, who else had one of these? I had one of these many years ago (I was born in the 50's) and I'm sure that mine took an old penny (1d), that would be the equivalent of 1/2p in decimal coinage! I've never seen one of these in my life and i'm a total 1990s child [born in 86]. Where have they been all of my life?!?! oh my goodness, I remember being SO jealous of my Mum when she had one of these! OOH im so envious!! 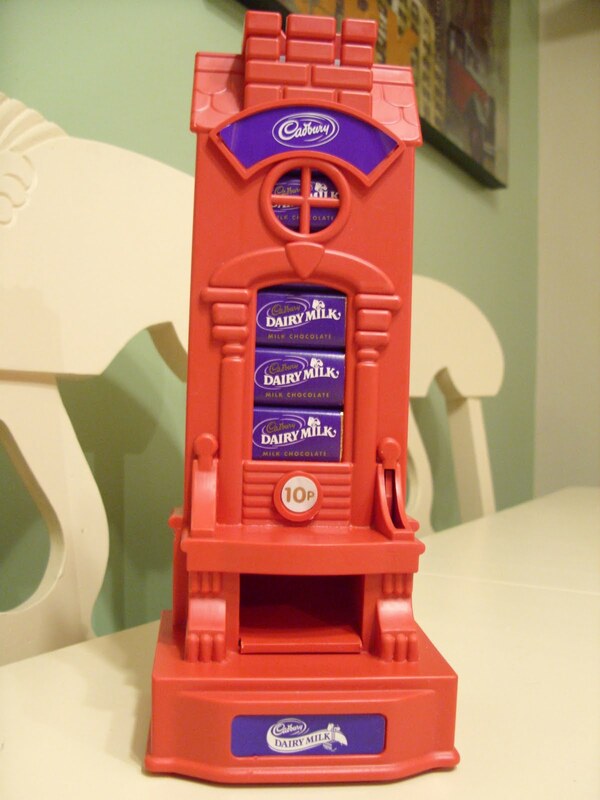 i love the choc money box machine too and it's cadbury too, my fave choc! lucky you!!! Ohhh the 90s! I remember it well! Didn't have an addidas tracksuit (but oh I wanted one!) I remember those amazing cadburies machines though - they were amazing! But this is fab, such fond memories! !